Since the release of my Valentine Bear with the heart shaped feet I've received numerous requests for regular feet so here they are! 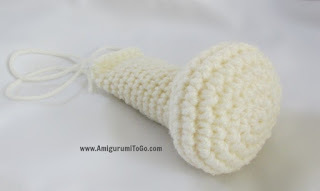 You'll need the Teddy Bear pattern here. Look for the green print friendly button at the bottom of the page. And of course you'll just leave out the legs and instead use one of the leg patterns below. I gave you 2 options for the legs. One made all one color and one made with 2 colors. The 2 colors could be coordinated with ears if you made colored ears for your bear. I am currently working on a dress for this Bunny! Check back soon for that pattern update. Important: When you start to decrease the feet you might see gaps in the stitches. You can eliminate most if not all of this gap by tightening up the stitches. This works very well for me. But there is also one other way to decrease called the Invisible Decrease. I do not use this method. I personally don't like it but it's not the method's fault it's mine, lol I tried it once and it felt awkward and I didn't like the look but other people have said that it needs practice and once mastered it's a great method. So I will leave the option to you. You can decrease the way I do and just tighten up those stitches or try the inv dec. I do not have my own tutorial for the inv dec but you can search the inv dec on youtube or try this tutorial by June Gilbank . sc until you get to the side of the leg. fold flat ch1 turn, and sc through both sides of the leg to close up the top of the leg. ch1 turn and sc across again then f/o leaving a tail for sewing. 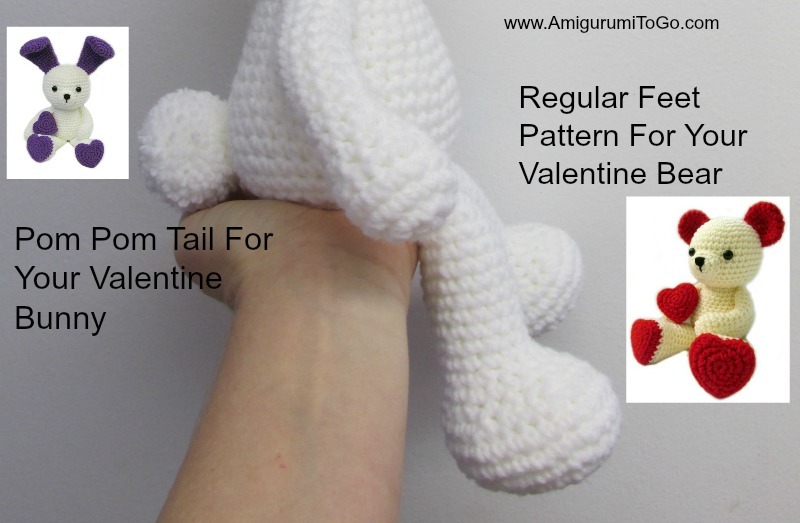 Refer to the Valentine Bear pattern for sewing. I hope you enjoy your Bear or Bunny. If you made one please post pictures on my facebook page, I'd love to see! So adorable Sharon! Thank you so much for sharing. BTW, I mentioned you on my most recent blog post, http://mykeeponkeepingon.blogspot.com/2015/02/adventures-in-amigurumi.html. I so appreciate everything you do for us amigurumi lovers! 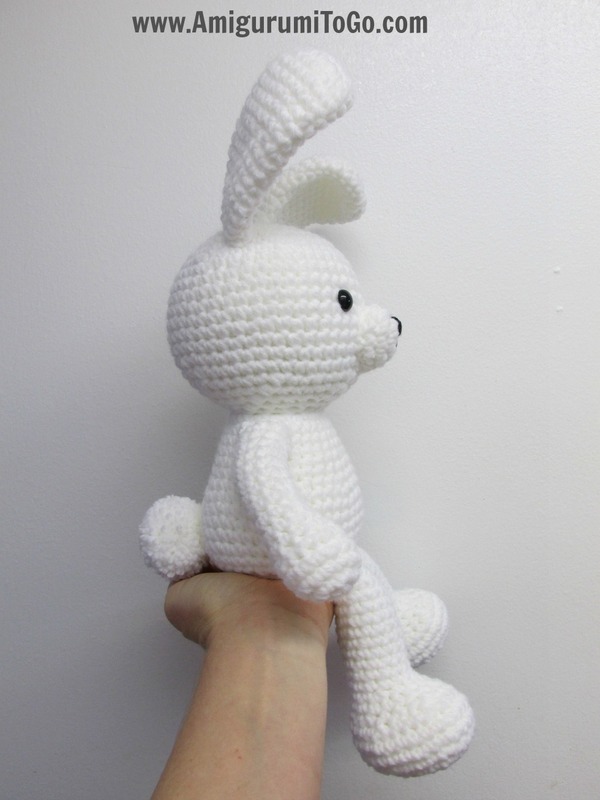 Hi Sharon, I noticed this bunny looks pretty big.. did you use 2 strands of yarn to crochet this one? I love the tail add on, makes it even cuter than it was before. Thanks in advance! Witaj Sharon, Twój kroliczek jest przesłodki, szlenie mi sie podoba,bardzo serdecznie dziękuję za wzór.Goraco pozdrawiam Jadzia. donde esta el patron con piernas de corazon? Yo lo quiero!! In the future so you don't have to wait for me to answer, I have a search bar in the upper right corner of this page and there's also a label list of patterns on the side of the page. Your free patterns are a blessing! Hi Sharon, thank you so much for sharing these beautiful patterns! Thank you so much for sharing your adorable animals, patterns and for sharing your time, your talent and creativity. Will definitely be returning to see what new adorable wonders you create.